A Russian Proton rocket launches the SatMex 8 communications satellite for Mexico into orbit from Baikonur Cosmodrome, Kazakhstan, on March 26, 2013, successfully returning the booster to flight. 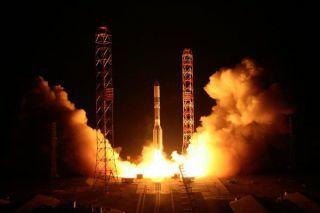 Russia's Proton rocket and Breeze M upper stage, a major player in the global commercial launch market, returned to service Tuesday with the successful launch of a Mexican communications satellite designed to bridge the Americas. The 191-foot-tall Proton rocket lifted off at 1906:48 GMT (3:06:48 p.m. EDT) from the Baikonur Cosmodrome in Kazakhstan, where it was 1:06 a.m. local time. The Proton's six-engine first stage powered the launcher for the first two minutes, then two more stages accelerated the rocket and its payload to nearly orbital velocity. Separation of the Satmex 8 satellite occurred at 12:19 a.m. EDT (0419 GMT) Wednesday. International Launch Services, the U.S.-based firm responsible for commercial Proton flights, declared the mission successful. The 12,068-pound Satmex 8 satellite, built by Space Systems/Loral of Palo Alto, Calif., is beginning a 15-year mission linking the Americas with C-band and Ku-band communications for Satelites Mexicanos S.A., or Satmex. Based in Mexico City, the company is Mexico's largest commercial satellite operator. The new satellite will replace Satmex 5, an aging craft launched in 1998. Satmex 8 adds 45 percent of total capacity over Satmex 5, translating to a 94 percent increase in Ku-band capacity, according to Satmex. Satmex 8 will be positioned in geostationary orbit at 116.8 degrees west longitude. Its 64 transponders will distribute video programming, broadband multimedia, and reach remote customers with telemedicine, distance learning and emergency services. The cost of Satmex 8 was estimated at $318 million, including launch services, according to a Satmex presentation to investors last year. "We are delighted with the successful ILS Proton launch and orbit of Satmex 8, the latest satellite in our expanding fleet," Northland said in a statement. "Satmex offers fixed satellite transmission services to more than 90 percent of the population in the Americas, and this important addition will provide enhanced performance and capacity to our coverage areas. It also positions us well for future launches of advanced models that will mark step-change expansions in our capabilities. Our sincere gratitude goes to all those who played a role in building and orbiting the Satmex 8 satellite." Tuesday's launch was the first flight of a Proton rocket and Breeze M upper stage since December, when a Russian communications satellite was deployed in the wrong orbit. An artist's illustration of the SatMex8 communications satellite in orbit. The satellite was launched into space atop a Russian Proton rocket on March 26, 2013. "We want to thank Satmex for entrusting us with the launch of the Satmex 8 satellite," said Phil Slack, president of ILS, in a statement. "We also want to express our sincere appreciation for the ILS, Khrunichev, Satmex, and SSL teams for their tireless work in ensuring the mission's success." The launch mishap in December was the third time in 16 months that a Proton/Breeze M mission failed to place a payload in the correct orbit. The Proton/Breeze M contractor, Russian aerospace giant Khrunichev, ordered the rocket grounded while investigators probed the cause. Engineers found the hypergolic propellant inside the Breeze M upper stage was too warm during the December launch. Converted into a gaseous state by the warm temperatures, the propellant accumulated near the inlet to the Breeze M engine's turbopump. The engine ingested the gas into the oxidizer turbopump, causing an over-speed that damaged a bearing, ultimately leading to the bearing's failure and premature shutdown of the engine. Khrunichev instituted refreshed quality control policies in the wake up the anomaly, including measures to ensure the propellant temperature stayed within limits. ILS plans a busy manifest over the rest of the year, with the next Proton launch scheduled for April 15 with the Anik G1 communications satellite for Telesat of Ottawa, Canada.